Last week it was my birthday, so I decided to treat myself to a celebratory meal at Fiesta Del Asado with a few friends. Everyone I’d spoken to about this place waxed lyrical about how amazing their food was and what a wonderful atmosphere the place had, so we ventured up the Hagley Road for our first experience of Argentine cuisine. On arrival, it was quiet but had a homely and welcoming feel. The open kitchen filled the dining room with sounds and smells, and the staff were friendly and attentive to our every need. After perusing the wine list, we quickly decided on a bottle of Malbec to share. When in Rome! Now, I don’t profess to know anything about wine, and I’m not usually one for red, but this was really pleasant, with enough fruitiness for me to enjoy. Then it was onto the food menu. It isn’t exhaustive, which I really liked (I sometimes get dazzled by too much choice) but it was pretty obvious we were all going for a beautiful piece of beef. Before that though we just had to try some starters. We ordered the Salchichas a la Parilla, with a traditional Argentine black sausage flavoured with paprika and caramelised onion, Rabas Fritas, also known as Calamari, and Gambas al Ajillo, tiger prawns with chilli and garlic. The starters were amazing, the prawns were sweet, tender and flavoursome, the squid was crispy on the outside and melting on the inside, the but Salchichas were just stunning, smoky like chorizo, with a flavour and texture almost like black pudding. I was well impressed already. 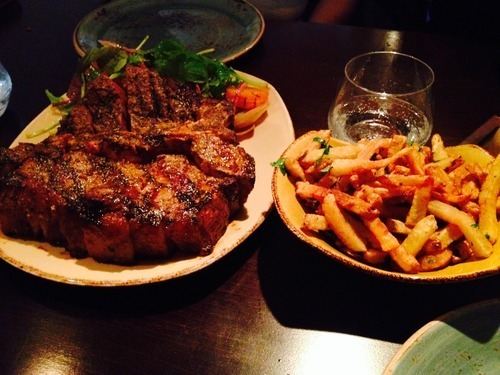 For the main course, I ordered the Bife de Costilla, a 40oz T-bone steak, to share with my partner. No word of a lie, this steak was the thickness of a Dictionary, cooked to a perfect medium rare and absolutely delicious alone, and accompanied by the chimichurri, Malbec reduction and bearnaise sauces it was served alongside. The beef had just the right amount of fat marbling to give it a wonderful flavour, and the chargrill from the Parilla really made it sing. I can’t stress enough how brilliant this meat was. It was so tasty, and so tender, it is one of, if not the best piece of meat I’ve had in this country, and we didn’t let a mouthful go to waste. We had ordered a side of the Papas Fritas too, chips served with parsley and garlic, which were also absolutely lovely, but a struggle to eat after that epic portion of meat! We were so full afterwards that we skipped dessert and coffee, but after that superb meal, we really didn’t need anything else. If you’ve never been to Fiesta Del Asado, I urge you to go. You can book a table of up to 4 online. I will definitely be going back, and I won’t be waiting until my next birthday!